My grandmother, Betsy, died on Thanksgiving Day, 22 years ago. She just didn’t show up for dinner. We all knew something was very wrong; she was never a minute late. For anything. And of course, when we got to her apartment, the newspaper was sitting at the doorstep untouched. She’d died peacefully in her sleep; a Kleenex and glass of juice by the bed. I never knew her husband, my grandfather. He died on New Years Day a long time ago – before I was born. Hmmm. Maybe we Goldmans should be more worried on holidays. I’ve been cleaning house lately. We’re moving. If you’ve ever sold a house, you know they tell you that it should be really organized and half empty. So I’ve been cleaning out. And of course, I don’t want to move things that I’ll never care about, never care that I saved. But there are things that I will never, ever part with. Like my Madame Alexander dolls. Or my mother’s Ginny dolls. Or my 45 RPM records. Or my mother’s and aunt’s 45’s. My crazy costume jewelry that I’ve had forever including the tiger’s eye ring that my first boyfriend gave me. I cried when he gave me that ring. At that moment, I knew that if I wanted to, I could marry someone some day. Truth is, I never thought getting married would be all that great. And that’s because of Betsy. Even when I was a fairly young woman, Betsy would tell me things to better prepare me for the world. Things like being fiercely independent is the key to escaping tyranny. Things like being eccentric is a way to keep people from getting too close to you. And trust me, she inferred, that is something you want to prevent. She told me the story – I don’t know how old I was – of the man she loved. He wasn’t acceptable, according to the Aunt that was caring for her at that time. So, she married the next decent guy who came along. My grandfather. By all accounts, he was a nice guy. A talented jeweler. A very heavy smoker. In fact, the rumors are that he smoked an entire carton the day he died. At any rate, he died young. And Betsy was a very young widow. My dad was an only child. And he was on his own by then. So here’s a beautiful young widow with no paying job (though she volunteered at the hospital 40 hours a week, I’ve been told) who is fiercely independent and eccentric. So by the time she starting doling out life lessons to me, she was probably just a little older than I am now. The thing about that rocker is the way the platform is situated, it is really easy to get your foot smashed totally under the rocker. It happened to me more than once. I bet it happened to my brother and sister, too. And yes, I bet it even happened to the slouchy guy in the t-shirt. Betsy told me never to get married. I was engaged when she died in ’87. She strongly suggested that we just live together. “Don’t marry him, dear.” she said. Others may have hinted it wasn’t a good choice for me. Only she told me so directly. I ignored her. And everyone else. But I never forgot – as I was miserable – that she did, in fact, tell me he was not for me. Or did she tell me that no man was? If that was the case, she was wrong, but I’ll let her have the benefit of doubt since she’s been dead so long I don’t really see the point of questioning her motives. I have some things that were hers. Each is special. I have a wooden box that has a note to her from her husband, a pin, an old Stebbins credit card in her name, and a little stuffed bear. I have her rose gold wedding band engraved BG. I have some very cool bracelets. And I have this necklace. 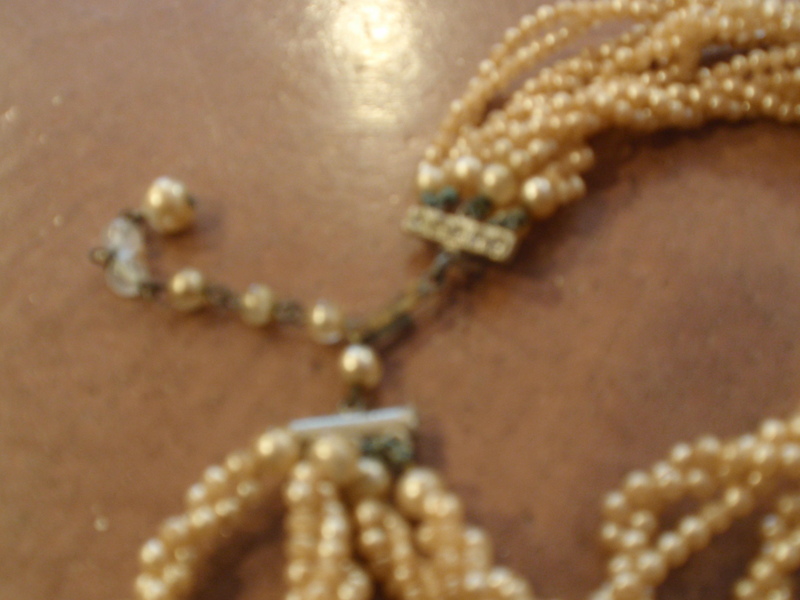 When my grandmother wore this necklace, I remember thinking she was the richest woman alive. All those pearls – all wrapped up together in a twist. And the diamond clasp. It was just like Jackie O would have worn. Maybe even fancier. And when she died, somehow the treasure ended up with me. It smelled like her. Like Rose Milk. 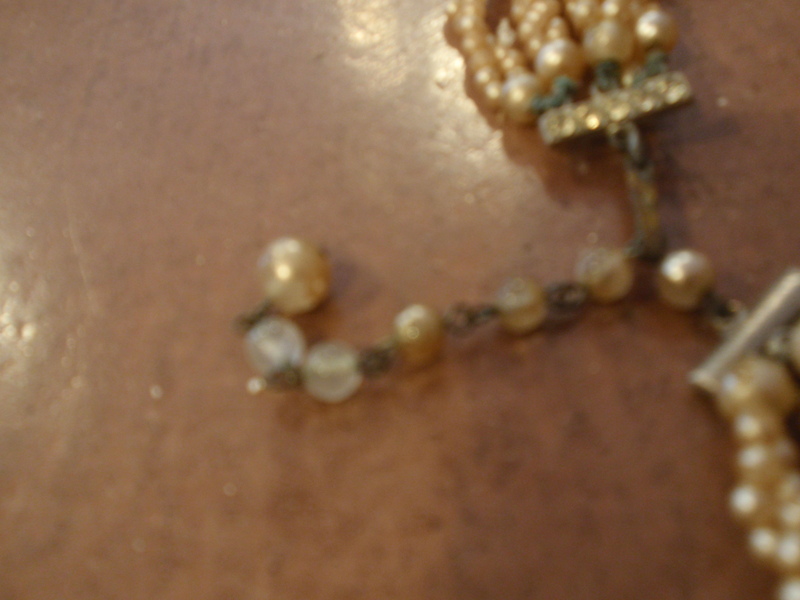 I kept it in its own partitioned part of my jewelry box. Until one day, I decided to wear it. went a million different directions. They smell now like paste and I saved all I could find and put them in a plastic bag. Has no sheen and are worn down. 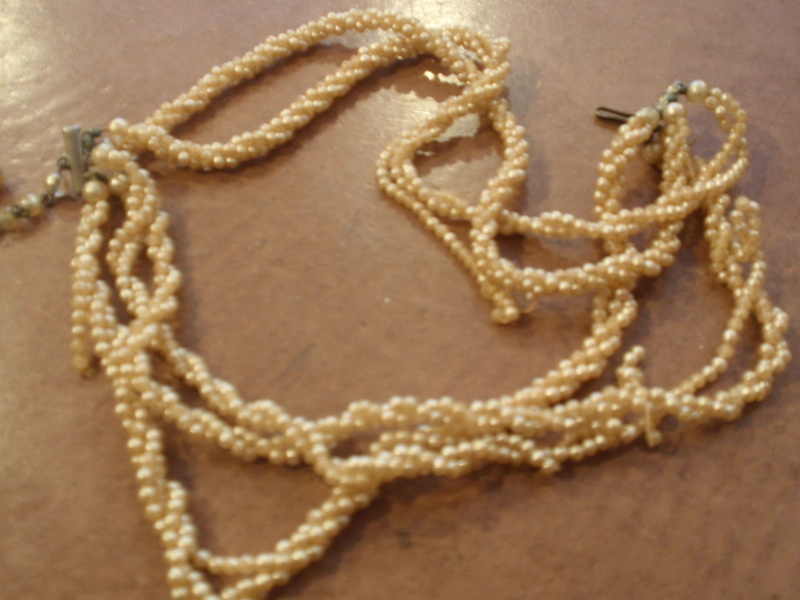 And this ersatz pearl and diamond necklace lay dormant in my jewelry box for more than ten years now. I can’t bear to throw it out. I guess it’s moving with me. Again. I have stuff like that. That’s a sweet story. Did you sell your house yet? I did not know you were moving! To where?? We’re buying a house in Chapel Woods. Still trying to sell our house – if you know anyone! loved this. loved it. loved it. loved it. country but it is important to select the right organization to get the best result. important to have good uptime, which means no downtime.